We slept until 7:30 – had a good night sleep after a long days travel yesterday. We ate a nice “included” breakfast buffet in the hotel breakfast room. 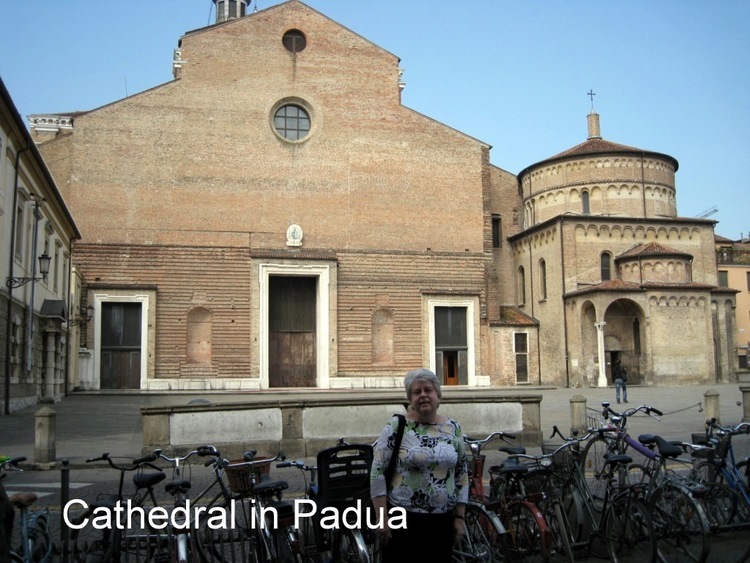 We started out on our exploration of Padua. Around the corner from us, where the music was last night, was a huge open vegetable and fruit market – Piazzo delle Erbe. Late last night it was filled with musicians and a large audience. Somehow during the early morning hours it was converted to this market with hundreds of stalls with every kind of produce imaginable. 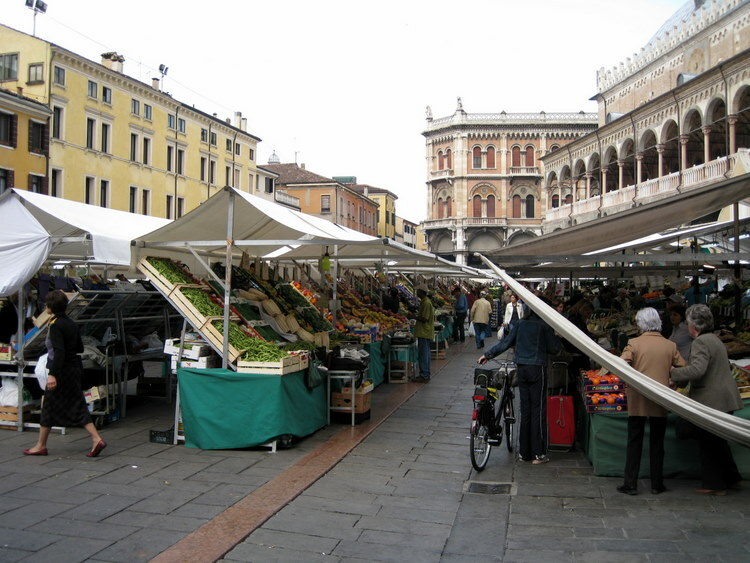 The market was located next to the Palazzo della Ragione. We visited this building the next day so I give more information on the May 9th page. We had forgotten to pack our tooth paste so we found a drug store and bought some. It was an interesting experience choosing an Italian toothpaste. We went back to the room to brush our teeth. With clean teeth we continued our exploration. It was only a few short blocks to the Cathedral. It was most unattractive from the outside. The façade, which is fired brick, has never been finished. There had been a church on the site as early as 899 which was burnt and almost totally destroyed during the Hungarian invasion. It was rebuilt in 1075 and 42 years later it was badly damaged by an earthquake. After some restoration it was decided in 1547 to rebuild it so it could meet the needs of the city. By 1630 the right transept for completed. The entire cathedral was finished and consecrated in 1754. Inside was bright and airy with a combination of baroque and modern statues. 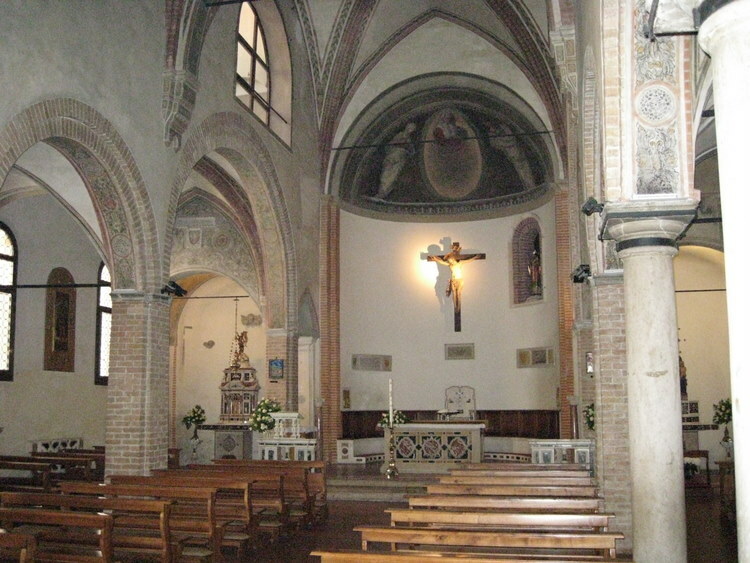 On the left side of the nave were five chapels which included the Madonna of the Blind and St. Gregorio Barbarigo (whose body can be seen). On the right side were seven chapels with statues of various saints which some relationship to the cathedral. 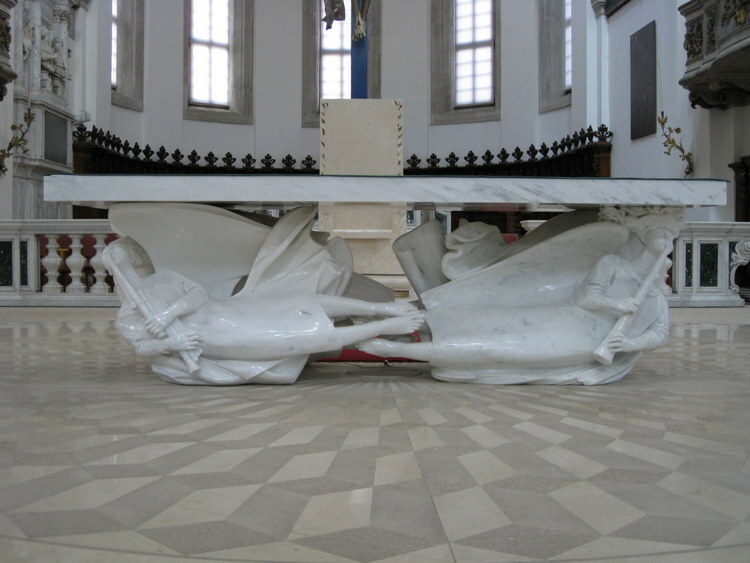 The main altar was very modern – slab of marble supported by four reclining marble angels playing musical instruments. 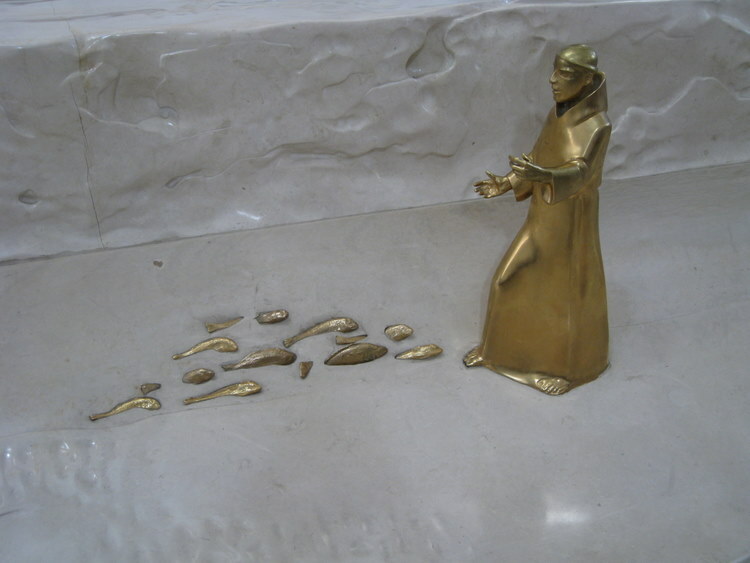 Near the altar was a small bronze statue of St. Anthony feeding some bronze fish shapes near his feet. I took a lot of pictures. Next door was the Baptistery which was built in 1260. It was unbelievable. The entire dome and all of the walls were frescos by Giusto de’ Menabuoi. We were not allowed to take pictures but we bought a book and several postcards. 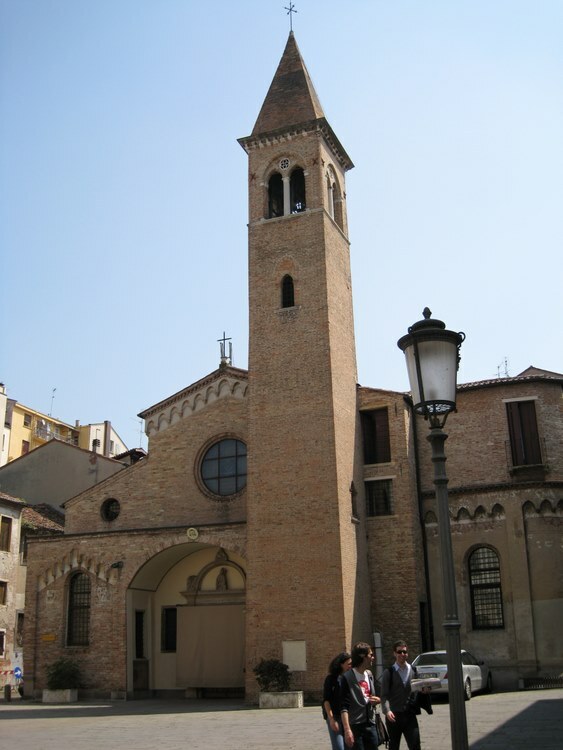 Our next stop was a small church called St. Nicolo, which dates back to 1088 and is considered one of oldest in Padua. St. Nicolo was the patron saint of sailors. The church underwent some restoration in 1305. The Baroque details were added between 1660 and 1680. There was no one in the church but us;however, while we were there a lady came in begging. The church had beautiful wood carved panels which are the only examples of this kind of art in Padua. They have been attributed to G.B. Vian, also known as Vianino (born 1564). They are St. Francis with signs of stigmata, the Bilocation of St. Anthony, St. Bernardine healing a king and St. John in the desert. 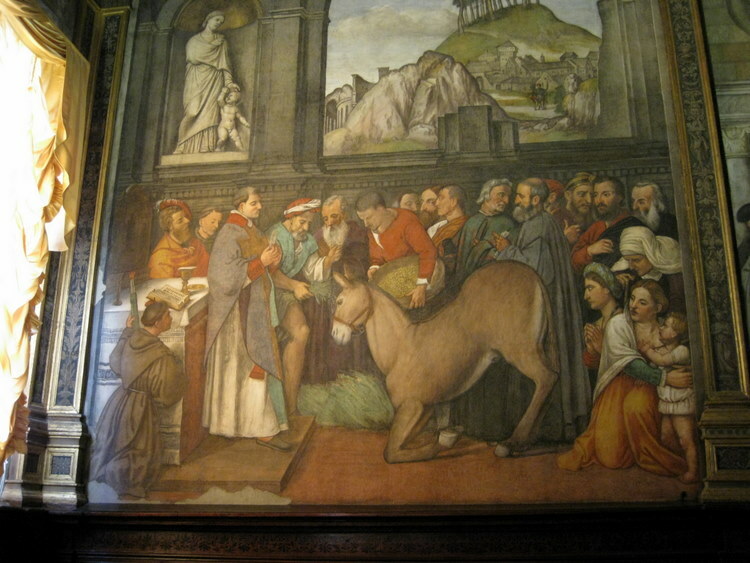 Most of the churches in Italy close at noon for several hours, so we were asked to leave. From there we walked on the other side of Palazzo della Ragione known as Piazza della Frutta, where there was a clothing market as large as the vegetable market on the other side. Nearby by was the University of Padua so we went into the court yard. 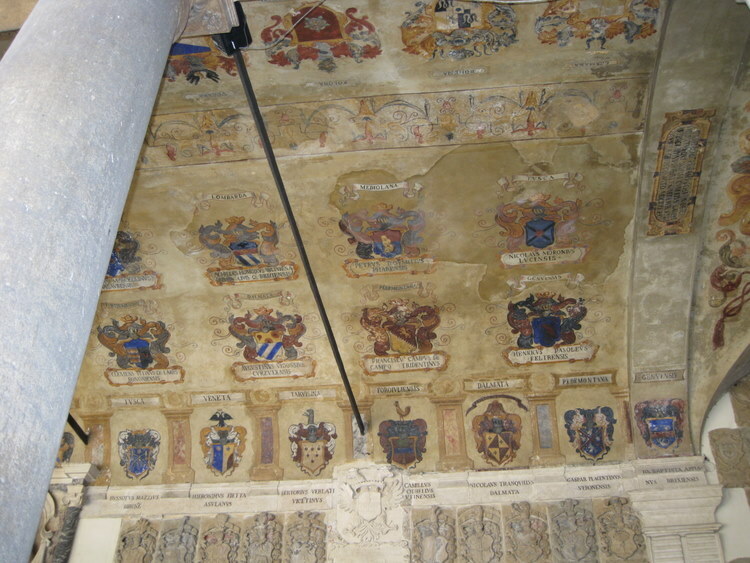 It was very interesting with a lot of coat of arms all over the walls. We are going back tomorrow and take a tour. We walked about eight blocks and found St. Anthony Bascilia. We stopped in a pizza restaurant across the street and split a pizza, salad and wine. We enjoyed studying the building from outdoor café. 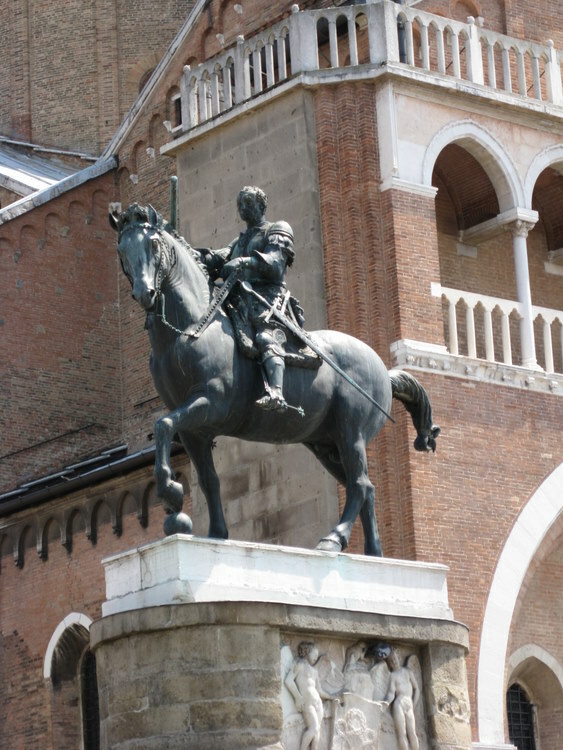 Near the north-east side of St. Anthony’s is Donatello’s famous statue of Gattamelata (Erasmo da Narni) on his horse. The basilica is dedicated to Anthony, who was born in Lisbon around 1195. 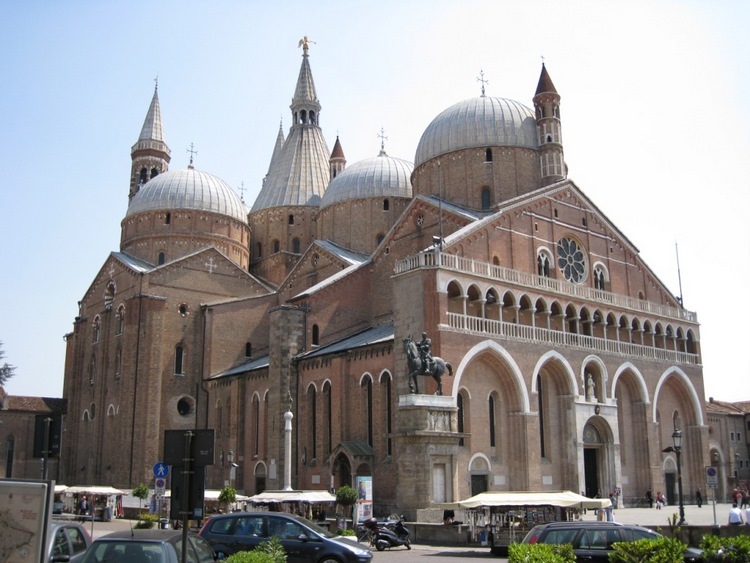 He lived and worked in Padua for two years and died in 1231 while traveling near Padua. 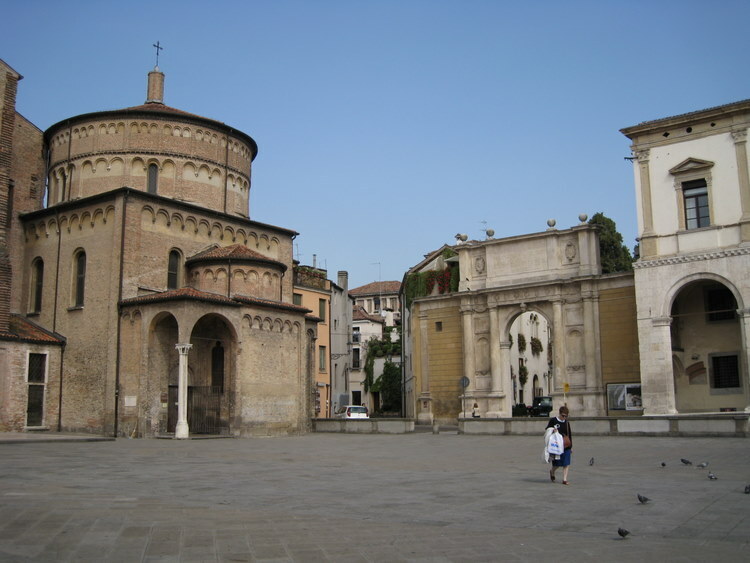 The citizens wa nted to bury him in Padua, so after Pope Gregory IX canonized him and the building for the saint was started. 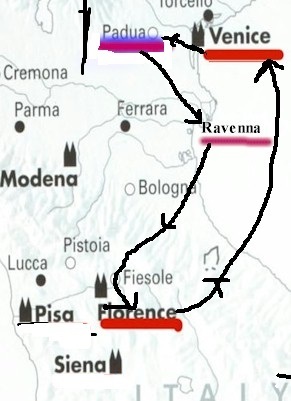 It was completed between 1256 and 1263. 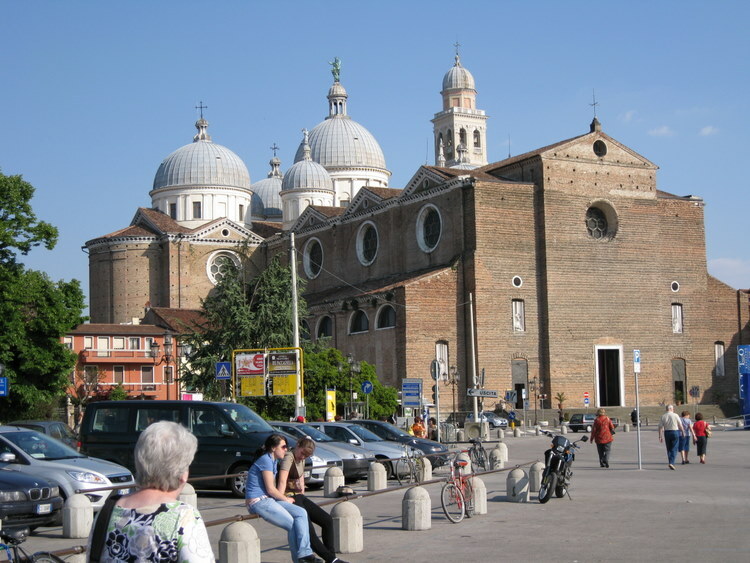 The exterior of St. Anthony’s has four arches and three bronze doors by Camillo Boito. Above the main door is a fresco entitled “The Saints Anthony and Bernardino adoring the monogramme of Jesus. Above the arches is a loggia with 17 columns. Higher up is a rose window. There are five domes and a central tower. 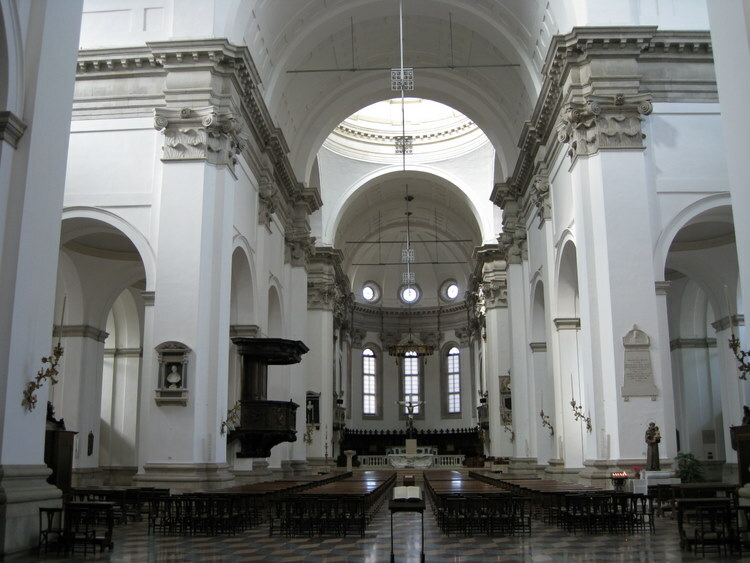 The interior has an aisle and two naves that are separated by two pillars and two transepts. 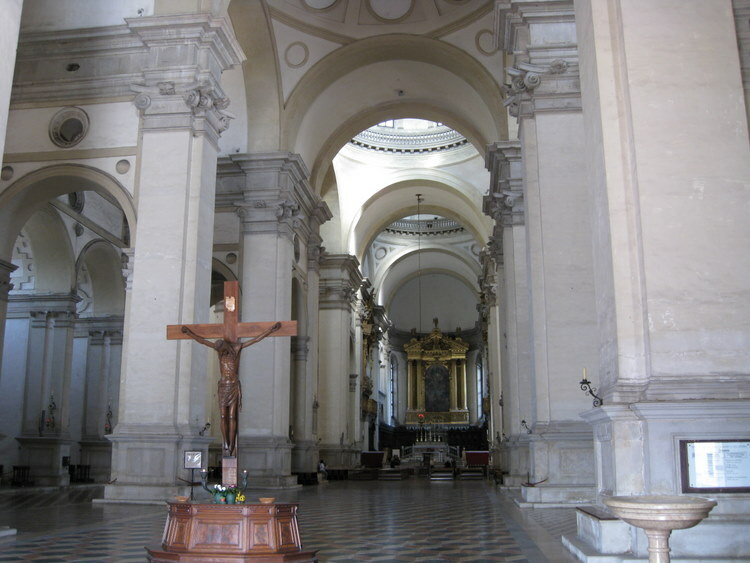 The crucifix and the main sculptures of the altar are by Donatello. No photos were allowed. They were working on the chapel where St. Anthony’s tomb was so they had moved his tomb to another chapel. Everyone walked by the tomb and touched it. Some people stopped to pray. St. Anthony is a patron saint of lost things so there were lots of picture of missing people on the walls of the chapel. We found the gift shop and bought a book and went back to the church to use the book to identify things. We saw a poster about a free concert that night so we decided that we would come bac k for it. From there we went next door to the St. George Oratory. It was built in 1377 but was destroyed by fire. It was rebuilt in 1837. In the school which was upstairs, all of the walls were covered with frescos of the life of Anthony. I don’t think we were supposed to take pictures, but there wasn’t anyone up there but us and a couple of other visitors so I took pictures of all the frescos. Downstairs was a chapel with beautiful fresco of St. George, St. Catherine and others. Another hike, this time to St. Guistina (Justine) church. It is the 9th largest basilica in the world. The church, like the Cathedral, had a brick unfinished façade; however it had more character than the cathedral. It has five domes. It was dedicated to Justine, a young girl of 16 who was condemned to death by sentence of the Emperor Maximinian because of her Christian faith. She was buried on Oct. 7, 304. Several basilicas have been built on this site. The present church was built in the 1480s. We spent a lot of time looking around and taking pictures (pictures allowed there). There were a number of lovely chapels with fine art. Of particular interest was a Chapel of Pieta with The Pieta plus statues of St. John and Mary Magdalen by Pilippo Parodi (1689). All five domes opened into the interior so the interior was very light. We attended the last part of a Mass in the chapel of St. Luke which had the golden Madonna on the wall behind the altar. The front of the church had modern statues of the Evangelists in separate niches. The doors had carvings about the life and death of St. Guistina . The church was located across from a huge park that had a lot of statues. We started walking back to our hotel and found a side walk café. I check the bar and the only bourbon that they had was Jack Daniel (no Jim Beam) so I ordered it. It was a pretty good shot for only 4.00€. We went back to the hotel for a few minutes to leave our books and freshen up. Then we walked back to St. Anthony for the concert. We stopped at a side walk café near the church. For our supper, my wife had chicken and I had a very good steak. We were a little early for the concert and were able to get seats on the third row center. Before the concert began, I noted several people taking photos. Since no one told them to stop, I took a few. 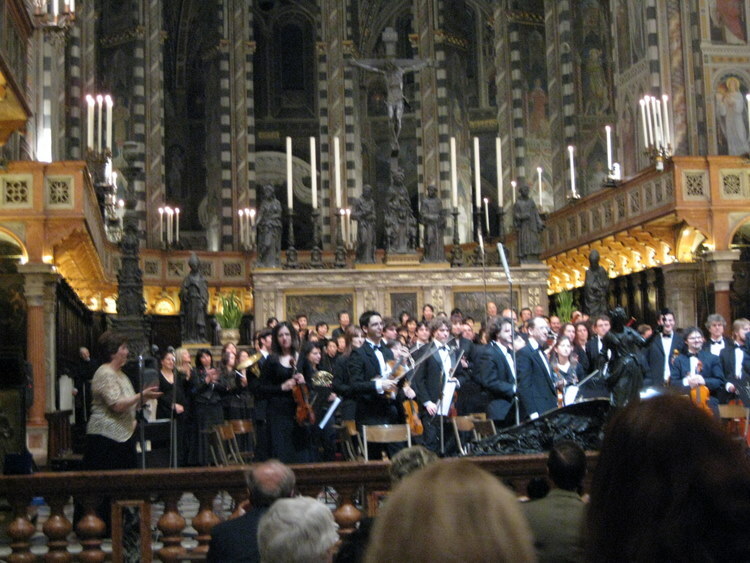 The concert in St. Anthony’s was part of the XVIII International Music Meeting with a Japanese Orchestra –The Silver Symphony Orchestra which had a large number of instruments plus about a fifty voice choir. 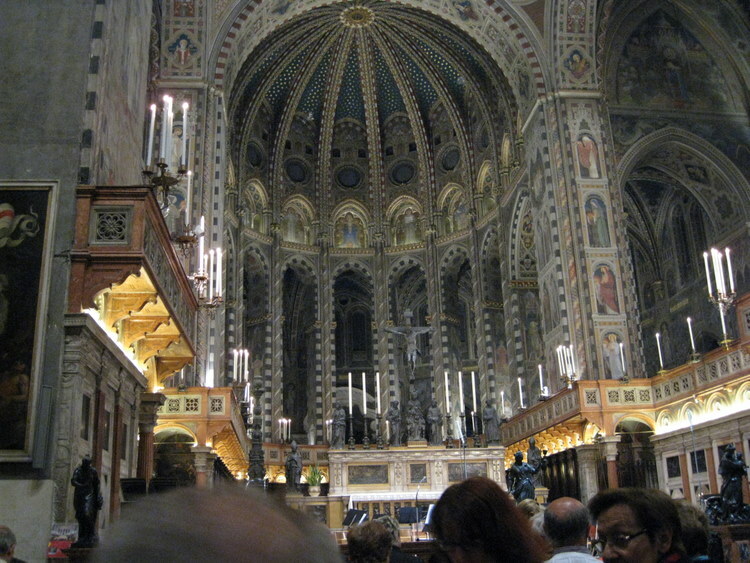 They played Albinoni, The Requiem and Messa di Gloria by Puccini plus a Japanese piece by R. Taki. There were two encores. The concert didn’t start until 9:00 and was over at 11:00. We walked back to hotel. We felt safe walking in that part of town after 11:00.